The original Laverne Langworthy/Yankee Shop Hudson, from the 1930s. 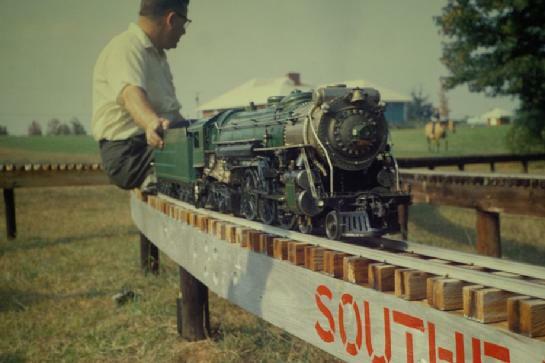 The 3/4" scale Hudson in "Southern Railway style" green. This photo taken circa 1967 in South Carolina. Another view of the same locomotive. 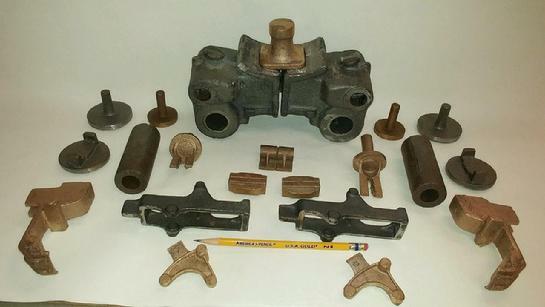 The 3/4" Scale, 3-1/2" Gauge "Yankee Shop Hudson", Baker valve gear version. Photo courtesy of Steve Bratina. The 3/4" scale "Yankee Shop Hudson", with optional Walschaert valve gear. Photo courtesy of Keith Taylor. Solid Cast Bronze "Tender Water Bottom"
Wheelbase, engine: 30-1/4 inches. Tender: 23-1/16 inches. Engine & tender: 62-7/16 inches. Rigid wheelbase, drivers only: 10-1/2 inches. Weight of locomotive (approx.) 220 lbs. 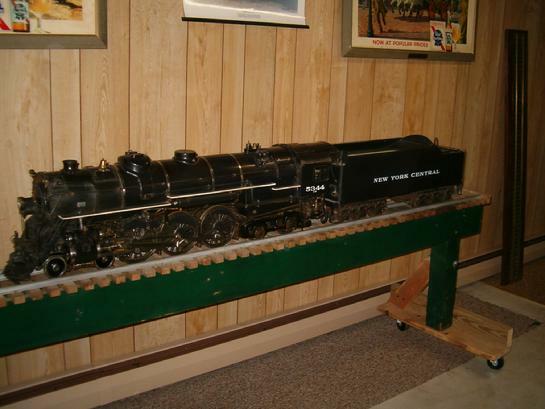 The famous "Yankee Shop Hudson" in 3/4" scale was designed by Laverne Langworthy of Westerly, Rhode Island. Mr. Langworthy was born in 1877. He was a high school machine shop teacher in Westerly. 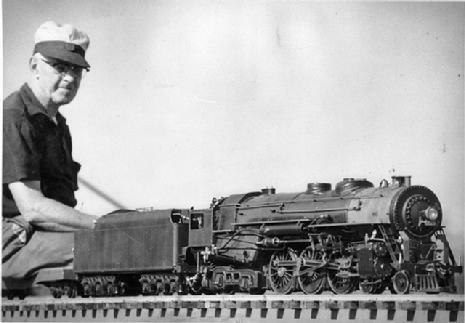 In the 1930s, he began designing, drawing, and making patterns for what was to become one of the finest models of a 3/4" scale New York Central "Hudson" ever designed. Beginning in the mid-1930s, he advertised castings for this Hudson in The Modelmaker magazine. Around World War II, Lester Friend of "Yankee Shop" bought the design rights and the patterns for the "Langworthy Hudson", and thereafter it became unofficially (but popularly) known as the Yankee Shop Hudson. Laverne Langworthy died in 1944. Please click the Paypal link at left to have your complete set of "Langworthy Hudson" drawings shipped to the USA. For other countries, please inquire. Please click the Paypal link at right to have your complete set of "Langworthy Hudson" drawings shipped to Canada. For other countries, please inquire. Cylinders; half-saddle piston valve type. Ports cored. Valve Chest Heads, rear; with valve crosshead. Valve Chamber Bushings (valve liners). *optional in lieu of Baker Valve Gear; in development 2018. 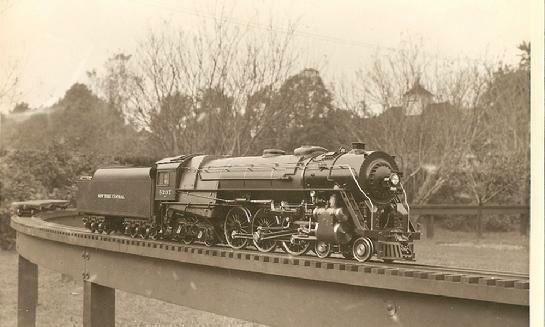 Classic Live Steam of Yesteryear: All castings produced in New England, USA, in the tradition of the "old days". Pilot Beam and Front Deck. Click the photo, to enlarge. The Pilot (cowcatcher). Please click the photo to enlarge. The drop coupler, knuckle, and counterbalance. Click photo to enlarge. Main frame center brace. Click the photo to enlarge, please. Main frame front brace. Please click the photo to enlarge. The Cradle. Please click on photo, to enlarge. Section One pricing: $795 plus $30 shipping to the USA, or plus $70 shipping to Canada. Payable with the "Paypal" buttons below. To pay by check, or for other countries, please inquire. Please click the "Buy" button at left, for your "Laverne Langworthy" Section One (frame castings) to be shipped to the USA. Please click the "Buy" button at right, for your "Laverne Langworthy" Section One (frame castings) to be shipped to Canada. The Pilot truck frame, and the trailing truck sides, front, and rear are all cast in ductile iron, made in USA. Ductile iron is easily weldable. Thus the trailing truck components can be screwed together, or can be pinned and welded into a single assembly. The "trucks" section for the 3/4" scale "Laverne Langworthy" Hudson. 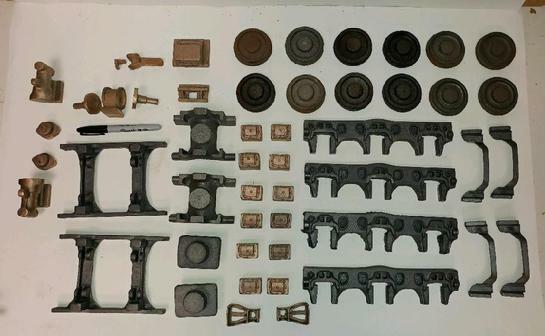 The trailing truck components for the 3/4" scale Hudson. Ductile iron, made in USA. May be screwed together, or, may be "pinned and welded" into a single assembly. Section Two Pricing: $895, plus $25 shipping to the USA, or plus $75 shipping to Canada. For other countries, please inquire. Click the paypal links below, to purchase. Please click the "Buy" button at left, for your "Laverne Langworthy" Section Two (truck castings) to be shipped to the USA. Please click the "Buy" button at right, for your "Laverne Langworthy" Section Two (truck castings) to be shipped to Canada. Patterns for the correct 17-spoke drive wheels as designed by Mr. Langworthy, were used in the production of these castings. This is the first time the 17-spoke drivers have been available in more than 70 years! Yankee Shop Machinists and later Friends Models, always provided an 18-spoke type. You now have available to you what Mr. Langworthy designed, drew, and intended. The Drive Wheel Section ("Section 3") is comprised of 2 heavy and 4 light wheels, with 17 spokes each; also 6 main bearings. All cast in New England, USA. Price for Section 3 is $750.00 plus shipping. You may click the Paypal link below to place your order for Section 3. The Drive Wheels. Click the photo to enlarge. The main bearings for the 3/4" scale NYC Hudson. Click the photo to enlarge. Please click the "Buy" button at left, for your "Laverne Langworthy" Section 3 (drive wheel castings & main bearings) to be shipped to the USA. The cylinder section for the "Laverne Langworthy" 3/4" scale Hudson. The cylinder pattern was upgraded to modern production standards, and the coreboxes which produce the "coring" (the steam and exhaust passages inside the cylinder; other internal voids; and some of the outside detail) were refurbished as required, while other of the core boxes, which were lost decades ago, were replaced with brand new ones. The refurbished pattern and the new/refurbished coreboxes, combine to produce the beautiful cylinder castings you see here. This is the first time these castings have been available since the 1970s. All castings in this section are of iron and bronze, sand cast in New England, USA the old-fashioned way. Section 5 pricing: $1,295.00, plus $25.00 shipping to the USA. For other countries, please inquire. 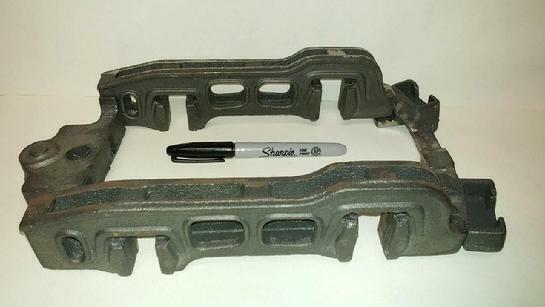 Iron castings are in ductile iron; thus the tender truck assembies may be pinned together and welded, if desired. Price $1,695.00 plus $30 shipping to the USA, or plus $75.00 shipping to Canada. For other countries, please inquire. The Tender section for the 3/4" scale Hudson. The truck components are ductile iron, made in USA. They may be screwed together, or "pinned and welded". 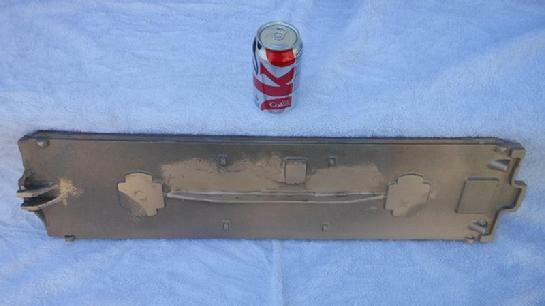 This is the underside of the Tender Waterbottom for the 3/4" scale "Laverne Langworthy Hudson". Bronze, sand cast in New England USA. It may be purchased below. The 3/4" scale Hudson Water Bottom is available for $750.00. It is made in the USA of bronze. Shipping is not included in the purchase price. It will be calculated based on your address and may be paid in a separate transaction. The rest of the tender section, "Section 7", such as: trucks, wheels, water pump, coupler, etc. is not included in the $750 purchase price. The $750 includes the tender water bottom ONLY. Laverne Langworthy at Danvers, MA in 1938. 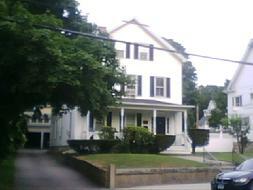 This is 21 Grove Avenue, Westerly Rhode Island.......the former home of Laverne and Grace Langworthy. Taken July 22nd, 2010. This home is just one block from the Westerly Station on the New Haven Railroad's famous "Shore Line" between Boston and New York (now Amtrak), and is the location from which Mr. Langworthy sold his Hudson castings in the 1930s. He died in 1944. 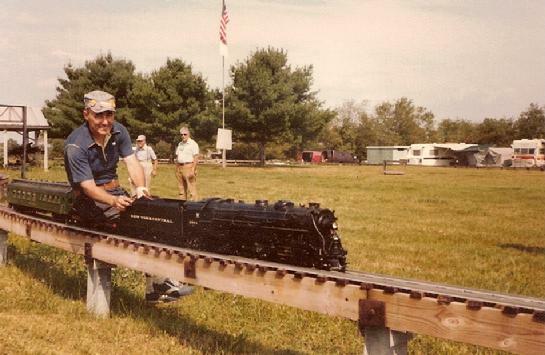 The late J. Drennan "Doc" Lowell at the Pioneer Valley Live Steamers' track at Southwick, Massachusetts in the 1970s, on a 3/4" scale, 3-1/2" gauge "Yankee Shop Hudson". A "Yankee Shop Hudson" at the New Jersey Live Steamers. 3/4" scale, 3-1/2 gauge, another excellent example of this classic by Laverne Langworthy. Mr. Hansen's "Langworthy Hudson" today.